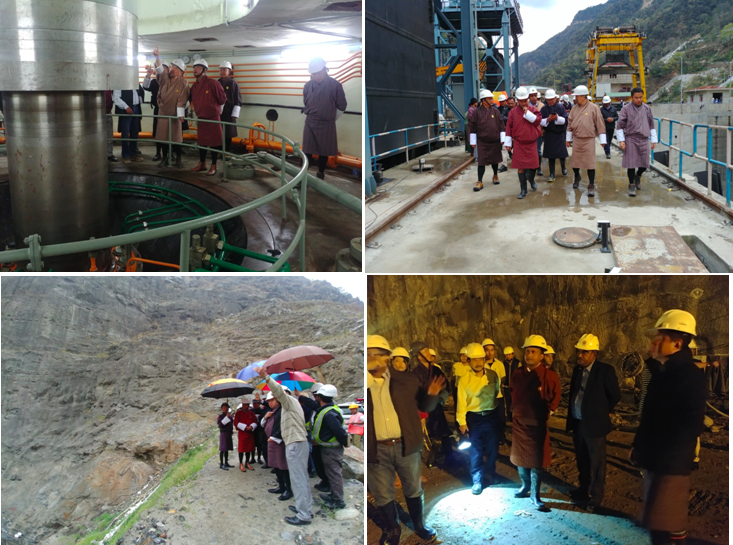 The Hon’ble Tengye Lyonpo accompanied by Secretary, MoEA, Managing Director, DGPC and Director, Department of Hydropower and Power Systems, visited four hydropower sites viz; Nikachhu Hydropower Project, Mangdechhu Hydroelectric Project, Punatsangchhu-I Hydroelectric Project and Punatshangchhu-II Hydroelectric Project from 31st March 2019 to 3rd April 2019. The site visits were made to take stock of the progress of the hydroelectric projects and also have face-to-face discussions with the project management teams, designers, consultants and contractors. The hydroelectric projects were all in various stages of progress and each project had unique attributes and issues being presented. The Hon’ble Tengye Lyonpo, in the capacity of Chairperson of MHPA, PHPA-1 and 2 noted the progress at the project sites, and provided guidance and motivation to the project management teams as well as the consultants, designers and contractors. The Chairman also visited PHPA-I and PHPA-II office complex at Bjimthangka and met the employees of the two projects. In all four projects, geological surprises and issues were witnessed at different stages of construction, although PHPA-1 case was observed to be still a serious challenge for geologists and designers alike. However, the Chairman being continuously focussed on the issue, requested the designers to come out with a final holistic assessment and solutions, which should be able to pave a way ahead for the project. The holistic assessment report is expected to be tabled by another one month. The Mangdechhu HEP is getting ready for commissioning with controlled reservoir filling being initiated on 2nd April 2019. Next Next post: Shortlisted Candidates for the Post of Laboratory Assistant.